Some heroes sign up for the Hire, others don't know they're being used until the job is done. How's that going to float with the likes of Punisher, Moon Knight, Elektra, and Ghost Rider? Let alone heroes like Iron Fist and Falcon? Chuck this title in your shopping basket and find out! 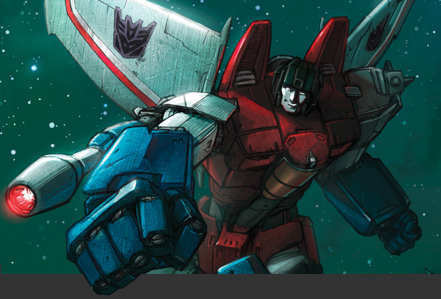 Transformers: Best of Starscream (TPB - IDW) Starscream; he's a kids introduction to plotting and scheming, and watching his battle to claim the Decepticon throne is part of what makes the whole Transformer shebang cool. Grab this package of the dude's best efforts and remind yourself why Transformers G1 is still the best crowd around. Ol' Black Panther has had a few seies in his time, but something tells me this one is going to be golden. Sure he's hijacking Daredevil's book to do it, but with the pulp art stylings of Francesco Francavilla and a tale by novelist David Liss pitting the new king of the urban jungle against Vlad the Impaler T’Challa has rarely had it so good. 'Christmas on Sesame Street was brought to you by "I want! I want! I want!!" - well at least it is for Larfleeze, DC's hogger of greed for all things. But when he decides to grab Santa for himself, that's when the other DC heroes step in - after all they want their new toys too. What December reads are you looking forward too? holy sh$%! that Starscream panel is awesome. somebody tell Craig quick! It's like you posted it just for me. 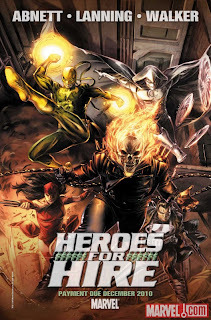 Heroes for Hire is also on my list (thanks to IronFistFan...gonna need to repeat the 12 step program for recovering comics addicts if I keep hanging out with you guys). Neither that nor X-Force is available at the local bookstore, so I've made my Christmas list for my kids. Let's see if they come through for me this year. I'll try Heroes for Hire, but it's full of some of my least-favourite characters. Well, I like Luke and Danny, and loved Moon Knight back in the Moench/Siekiewicz days, but Punisher and co, not so much. Still, Abnett and Lanning always bring something good to the table. Thanks for the comments guys and welcome to IADW Mart! When I clear-cut his fist out Craig I thought of your icon - but when a picture is as cool as that how can you not make it a little 3D? I've got a blog cross-over in the works with IronFistFan about H4H too - so lookout for that to help with step 1. I know what you're saying Mart, I wasn't too much of a fan of the likes of Silver Sable, and Paladin etc but I am looking forward to another DnA monthly. Those guys always bring the goods! Well, Reed's already died and Hickman is in love with him; Sue won't die because it will distract Reed; Ben is too popular ... so it's Johnny. He's barely in the book anyway, poor soul. Ben is who made me a Marvel fan after years of only looking at DC. I'm still more the blue team than the red now but he's the one that leveled the playing field. Well, him and the Hulk. I've never been a Hulk fan, though I liked it when he was obsessed with beans. I love the Thing, though. Have you read the Project Pegasus saga from Marvel Two-in-One (now in trade)? They're some of my favourite Benjy stories, along with those in John Byrne's Thing title. Always good to meet another fan of those Marvel Two In One books Mart! I loved all those 80's team up books, and if I didn't know who was in any of the others, M2I1 won my money by default just by including the Thing. I agree - few have written Thing as good as Bryne as well.